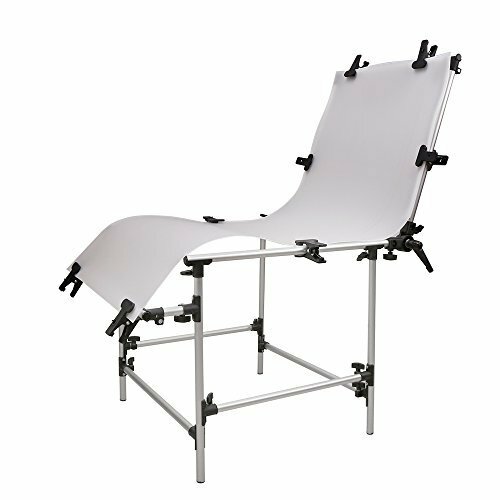 The 60×130cm studio shooting table is a translucent durable and versatile shooting set, which is extremely suitable for all lever photographers. It is lightweight yet strong enough to hold a variety of still-life products. The professional shooting table can conduct a variety of lighting arrangement based on the need of shooting. Perfect for small to medium size photography, such as online business needed. Aluminum alloy frame, diameter 1.9cm, lightweight and durable. Translucent material provides perfect side lighting, back lighting and under lighting. PVC panel size: 60×130cm. The PVC panel can be rotated 90°-180°.